Based on Alpina's past performance, this could be the 5 Series you'll really want to own. In many ways it's a shame that Alpina doesn't have the following it deserves. For sure, part of the appeal of owning an Alpina is that it's an exclusive and discreet car that only those in the know will truly appreciate, but we would love to see more people take an interest in this manufacturer of BMW-based executive cars. As a result, if you're someone who's interested in the new BMW 5 Series, we implore you to hold out for the Alpina version you see in these photos taken by our spy photographers. Spotted for the first time at the Nurburgring Nordschleife, the car pictured here is claimed by our sources to be the gasoline-powered B5 model. A diesel version, dubbed the "D5," will also be offered, but we'd be surprised if that model makes it to US shores. As a result, the car in these photographs will likely be the alternative for those who want a similar pace to the upcoming all-new BMW M5, yet would prefer such pace to be wrapped up in a subtler package with a less racier character. Oh, and as Alpina typically doesn't put electronic speed limiters on its cars, this new B5 should be rather quick in a straight line. As in "most likely just shy of 200 mph" fast. Do expect to wait a good while before the Alpina B5 goes on sale. BMW won't want an Alpina-badged 5 Series released before the new M5, so we likely won't see this car in showrooms until 2018. 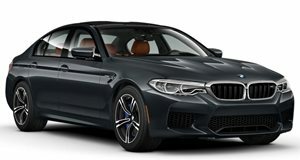 Plus, it's bound to go on sale at a significant premium over the M5, and that's assuming Alpina will decide to sell the B5 in the United States. Currently, Alpina only offers the 6 Series Gran Coupe-based B6 and the 7 Series-derived B7 in North America. Fingers crossed Alpina does offer the new B5 in the USA. Based on past B5s, and what we know of the new G30 5 Series, this high-end executive sedan should be a rather stellar piece of kit.